William Welty has appeared in two of my posts, with his appearance here. It is a tribute to his resilience and persistence in the face of economic and business pressures. These were due to attempting to start and sustain a small size fountain pen company in the Midwest during a time of intense competition from bigger companies and the never ending needs of additional capital and legal battles from the likes of the Conklin Pen Company. My first mention of Welty was in my post of December 12, 2007 where I restored an Evans Hump Filler pen. That was a pen dating to approximately 1915, a few years before this pen. As you can read in that post, after Welty won his lawsuit against Conklin, he was in need of additional funding and brought in Evans as a partner in the Evans Pen Company. After this he also entered into a relationship with the Moore Pen Company of Boston, MA to produce the Servo, or Moore-Servo pen. This is an example of a pen made in the short time that Welty and Moore were together, before Moore took over the line completely. Eventually, Welty left Waterloo and headed for Chicago, where he again started up the Welty Pen Company. It was the final move for Welty and the Company seems to have remained there into the 1950s. At the end of this post I will show a picture of a Welty Chicago fountain Pen. Here is a photo of the dismantled Servo Fountain Pen, which was probably produced sometime after 1917 in conjunction with Moore. The unique Welty Filler Patent can be found by clicking here. As you can see, the lever is reverse to most lever fillers and opens from front to back. It is a hooked shape lever that attaches to a pressure bar which is under the sac (not above as in most lever fillers). A detailed view of this filler can be seen in the patent link in blue above. 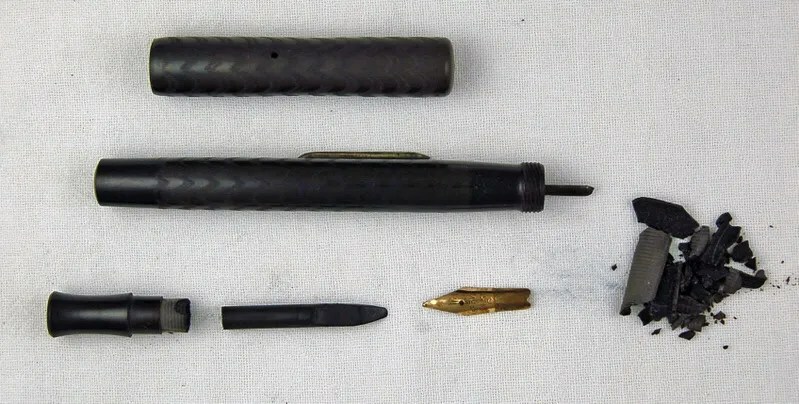 Here is a picture of the pen reduced to its parts. The lever and pressure bar can be seen at the top and end of the barrel. You can see the end of the lever pointing to the front of the pen, ready to be pulled up and toward the back , thus lifting the lever from the bottom of the barrel, compressing the sac. This was a relatively simple repair. I cleaned up the old sac remnants from the section, using an x-acto knife. I then cleaned the section with a q-tip, removing all of the old ink. I then cleaned the feed and nib. The feed with water and dental pic in the channel. The nib (14K) using a dremel and simichrome. The nib is a 14K Servo No. 2. The reverse lever is not gold, and I was able to remove the tarnish with simichrome and a lot of rubbing with a soft cloth. I attached a number 16 silicon sac to the section/feed/nib and inserted it in a different manner due to this unique lever/pressure bar. I held the pen with the lever on top so that the bar released to the bottom of the barrel and slid the sac assembly between the top lever and the bottom, where the bar rests. Now, when the lever is lifted, the bar will be pulled up to compress the sac. This is contrary to the standard lever filler where lifting the lever pushes the bar down into the sac. Water testing was successful – no leaks and a steady flow of water after filling. Here is the finished product, followed by the unique imprint showing the largest geographic distance I can remember on a fountain pen imprint. As I mentioned earlier in the post, William Welty eventually left Waterloo, IA and headed northeast to Chicago. Here is a picture of a later Welty pen, from Chicago.